Whenever I place my tired feet on Australian soil, I am always amazed that I have managed to reach the other side of the world. What makes it even more extraordinary is the fact that my journey was relatively straight forward. It was certainly long and tiring, but in a little over twenty four hours I can find myself in Melbourne with relative ease. When I think of the first visitors who headed into the unknown on horse back and then by boat for weeks on end it really does "blow my mind". As our history books will tell us, the first explorers came in search of gold, but even today, the allure of Melbourne is just as strong. Rather than a gold rush, we come in search of culture, sport and adventure. 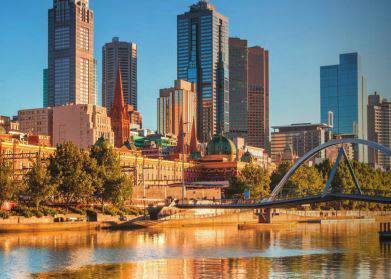 The flight from Sydney to Melbourne is just over and hour and once you have made it that far, here are a few reasons why Melbourne is not to be missed. The Crown Complex is conveniently central and consists of three main hotels, The Crown Towers, The Crown Metropol and The Crown Promenade. I stayed at The Crown Promenade and although, it is the most cost effective option the rooms are still spacious and well appointed. The complex boasts numerous 24 hour casinos, shopping malls, bars and eateries. Margo's is perfect to grab a quick snack, Sho Noodle Bar a must for dim sum lovers and The Merrywell Downstairs great for cocktails. The complex is a short walk from the South Bank offering many more dining choices and a "stone's throw" from Flinder's Street Station, one of the oldest in Australia. I am fascinated by the history of Melbourne,Victoria and Australia as a whole. The Immigration Museum is located on Flinder's Street and well worth a visit. It explains the cultural diversity of Australia in an honest way that provokes thoughts and emotions. The visitor is transported from1800s to the present day. History lovers may also be interested to visit Cook's Cottage located in East Melbourne. As we know, Captain Cook is credited with discovering Australia and this is the actual cottage where he lived which was transported from Yorkshire, England and re-built in Fitzroy Gardens. It is an English country cottage and extraordinary to see in it's not so new surroundings. For something completely different, head to the Eureka Tower and check out the view from The Eureka Skydeck 88. The express lift will make your ears pop, but the view is incredible. This is the highest viewing platform in The Southern Hemisphere and the glass cube is certainly not for the faint hearted, if like me the glass outdoor lifts on the Lloyds Building make you feel a little bit funny. There is an audio tour available to be able to pinpoint landmarks along with various activities for all ages. Nature lovers will enjoy both The Melbourne Zoo with it's award winning Asian Elephant Trail and the Phillip Island Nature Park. I have yet to meet someone who does not love penguins and it does not get much better than the "Ultimate Penguin Tour" where visitors can watch the birds from a secluded bay. Expensive, but certainly worth it. Sport plays a big part in Australian culture and arguably at the top of that list is cricket. No cricket lover would come to Melbourne without seeing the fantastic MCG. This is a stadium of epic proportions where tours run daily if you are unable to see a game. I was lucky enough to see England play Australia and this was without a doubt one off my bucket list. There is no shortage of places to shop in Melbourne. Collins Street will certainly help you part with some dollars- be it couture fashion, fine art or jewellery. The National Opal collection is located less than a block away and this is part museum, part gallery and part boutique. There are lots of beautiful gems to buy, dazzling one off pieces to view and lots to learn about outback opal production from pre-historic Australia to modern day. For the ultimate fine dining experience be sure to book a table at Attica. Head Chef is Ben Shewry who was recently awarded The Good Food Guide's prestigious Chef Of The Year. Attica was also named the best restaurant in Victoria in 2014 so expectations are very high and do not disappoint. Dishes are seasonal, adventurous and the whole dining experience, world class. Hare and Grace is located in the city's CBD and, although in the heart of the city, it has a large outside area surrounded by the restaurant's vegetable garden. The ethos behind this restaurant is fresh, healthy and simple and it certainly does not disappoint. This is a perfect spot to enjoy a light meal and drink with friends, although the dinner menu is equally extensive and innovative. Quantas of course! With brilliant service, great food and all mod cons and that is even in economy. A faultless history, the national airline of Australia is the obvious choice.